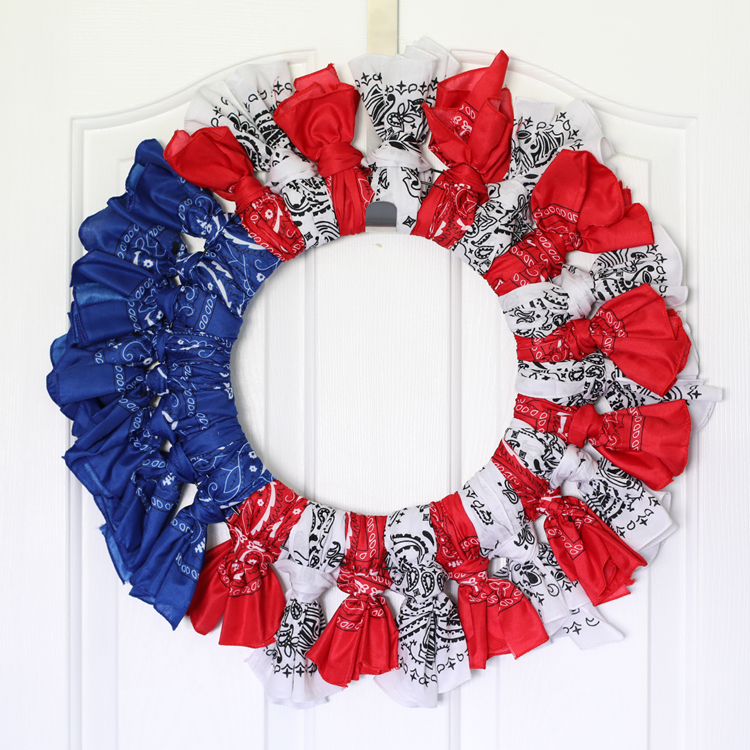 A bandana wreath is a fun and playful wreath perfect for summer. 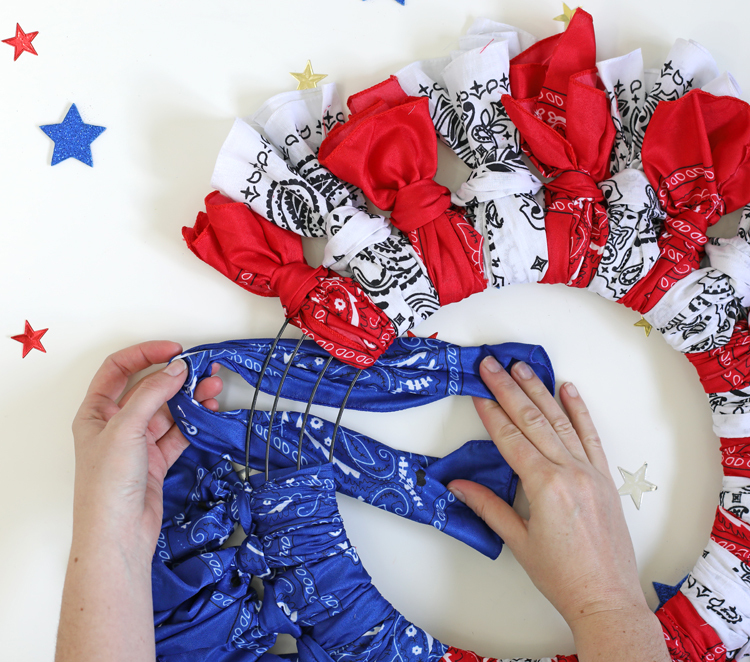 Learn how easy it is to make a bandana wreath with this simple tutorial. Have you seen a bandana wreath before? I just think they are so cute that I had to try my hand at making one. 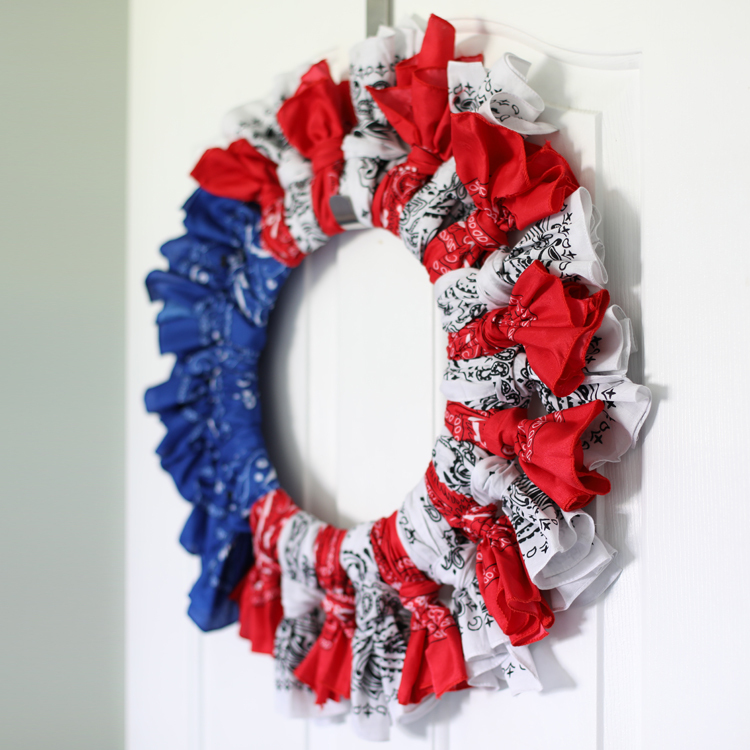 I chose a patriotic themed wreath for the Fourth of July, but you can easily change up the feel by what color bandanas you use. Some affiliate links have been used. I found bandanas 2/$1 at Dollar Tree, but they didn’t have white, so I picked up a few bandanas from Hobby Lobby too. They had a huge selection of awesome colors for $1 each. 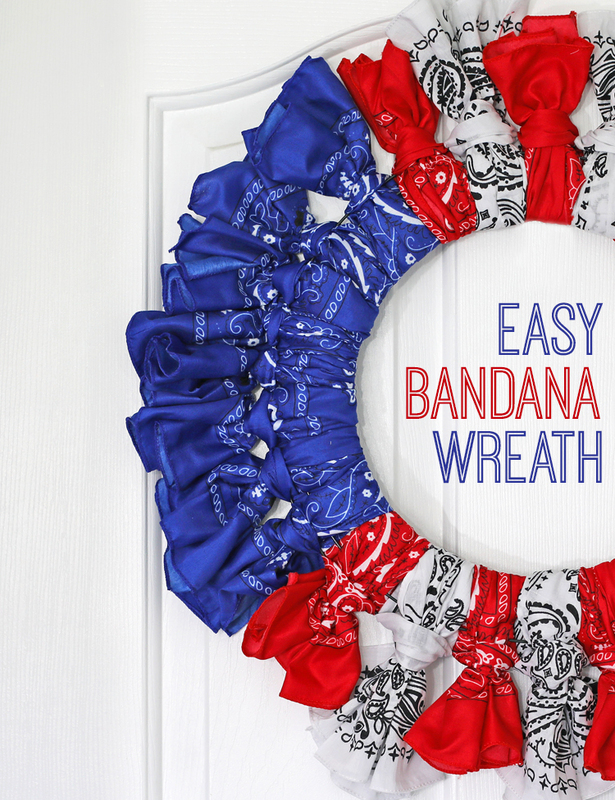 If you use a wreath form that’s bigger than 14 inches, you’ll need to buy a few more bandanas. If you use a smaller wreath form, you can buy fewer bandanas. 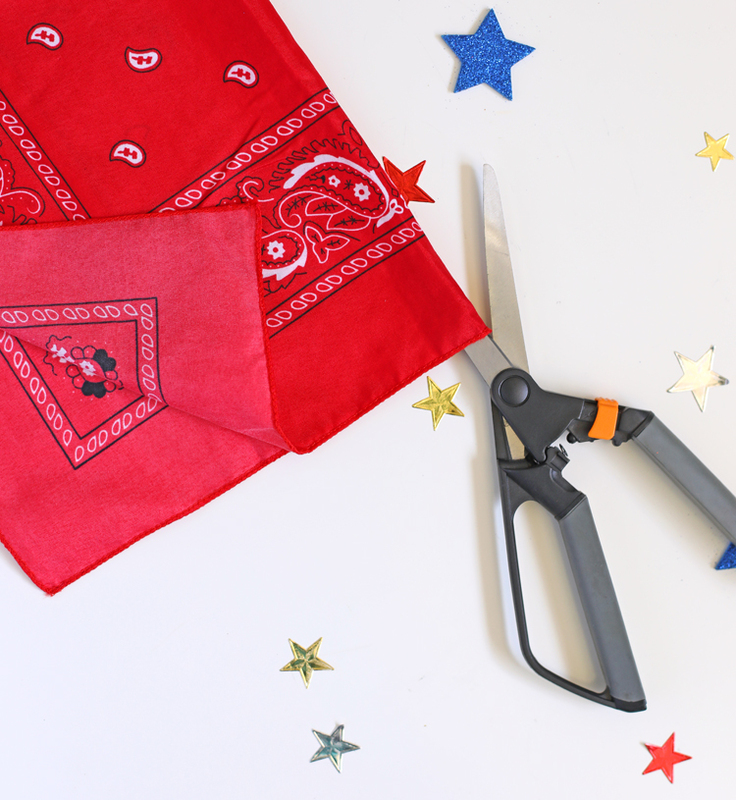 Begin by cutting each bandana in half so you have two long, skinny pieces. Repeat until the whole wreath form is full. I chose to do a red and white pattern around one side, then a patch of blue so that it would mimic the American flag. Tighten the knots down and fluff the ends. 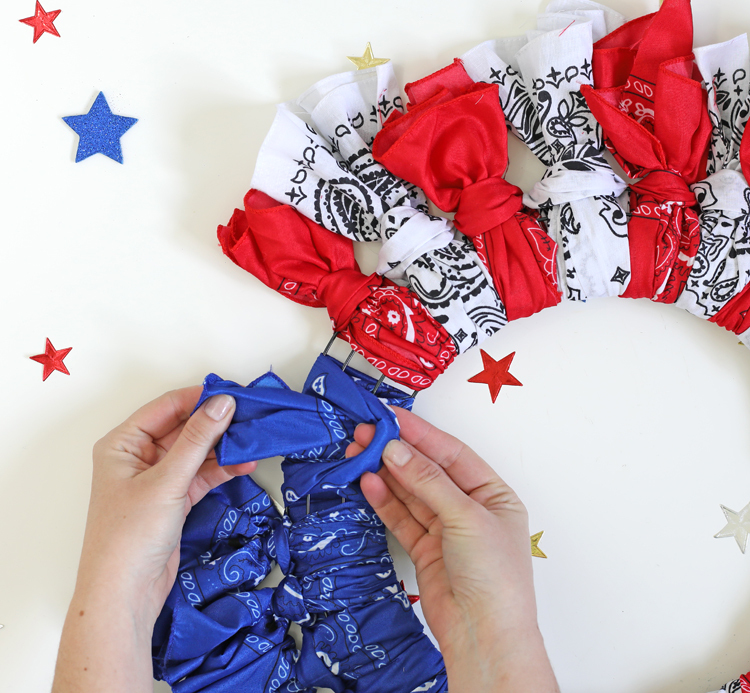 If you’re worried about the bandanas coming loose, you could secure each knot with a bit of hot glue, but I don’t think it’s very necessary. There you go! Isn’t that a fun project? It’s so easy, but turns out so cute. It would make a fantastic craft project to do with friends or to make at summer camp. The big question is: what color of bandanas are you going to choose? Oh, darn! You can spray liquid starch on the ends and iron them to keep them firm. Spray starch might help that. I see two bandana wreaths in my future: one American, one Irish. Fun and easy. An Irish one would be darling. Great idea! This is something else for my Irish roots theme. I already fly an American flag over my Irish wedding flag. I love love love this project! And it’s versatility; but I am still not sure about how to make the knot. Please help. Hi Bee! Did you watch the video at the end of the post? I tie the knots several times in the video, so hopefully that will help you figure out how to do it. What size bandanas did you use? The bandanas from Dollar Tree were 20″ and just a bit smaller than the ones from Hobby Lobby, which were 21.5″ but they both look good on the wreath. If you’d like to starch them, I’d do it after just on the “tail” parts that stick out. I made one today for my parents and it turned out GREAT! Love this!Hope mine turns out like yours!!Thanks! When I first made these I was instructed to use a styrofoam wreath…..please use a wire wreath. When dropped on hard surface the styrofoam will break. Thank you for sharing that great tip! Have had this happen a couple of times – I now wrap my foam wreaths in a layer of soft, small width duct tape before decorating them!! So very cute and better yet…EASY!!!!! Thank you for the wonderful idea. Thank you for sharing. I love it. Can’t wait to get some bandanas.. Mine frayed a little, but I just tried to tuck the cut ends in as I folded them around the wreath form. Since the wreath won’t be getting a lot of wear and tear like it would if you were wearing the bandanas and washing them a lot, I wasn’t too worried about it. You know, you could use pinking shears to cut it and no fraying. This is one of the cutest and easiest ideas I’ve seen. Thanks so much for posting! Great idea Barb! Thanks for sharing. I used pinking shears on mine. When I tied each Bandana to the form I folded the Bandana in 1/3 and placed the raw edge inside. This will help to keep it from fraying. You can even use a little Elmer’s glue on the frayed ends to keep in tack. Great project. One I plan to do with my grandkids. Thanks. Great suggestion. Thanks for sharing! They also sell a product called Frey Check. It even stops t-shirts from fraying any more. Absolutely Positively Beautiful! I’m going to try making one. Thank you for sharing. It’s to cute going to make on myself Thank you. I love this! I could actually do that! Thanks for sharing! What size bandanas? They come in different dimensions. I just bought the regular craft bandanas. The ones from Hobby Lobby were a little bit bigger than the ones from Dollar Tree, but I was still able to use both sizes and get a good result. My granddaughter would love doing this. I’m thinking about a Halloween one too! I have tons and tons of fabric … I would like to try this with just fabric instead of purchasing bandannas. That would totally work and it would be adorable! Thanks! Going to make one with my grandson. How about the wreath form hard to find or not? VERY common! They have them at every craft store and I got mine at Dollar Tree. I went to Hobby Lobby first. Bandanas were .99 cents. They had all colors. They are a bit “stiffer” than the ones at Dollar Tree. They were $1.00 at Dollar Tree. Will it make a difference? The Dollar Tree bandanas were softer. I hate to make it and see a difference, since they are all the same price. My Dollar Tree didn’t have 15″ wreaths, only 14″ wreaths… 🙂 ? 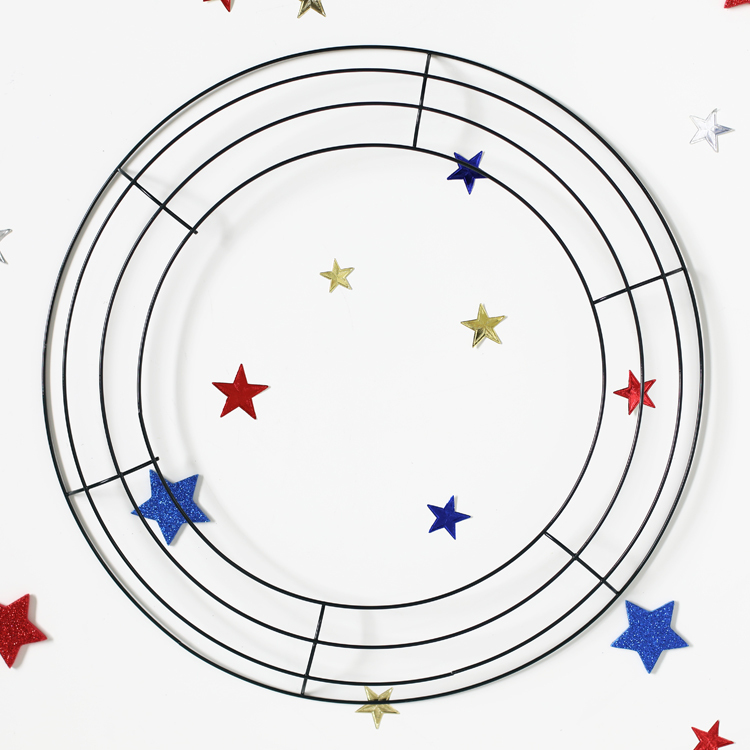 The 14 inch wreath form will work perfectly… maybe I measured mine wrong and it actually IS the 14″ form. The fabric on the bandanas from Hobby Lobby IS different than the Dollar Tree ones, but I mixed mine together and it still looks cute. No worries! You’re welcome. I’m so glad you’re making it. So fun! I just made mine! I love it…I’m thinking of making a red and green one at Christmastime! By the way, my scarves were 99 cents each at the Dollar Tree and same price at Hobby Lobby. A Christmas one would be darling! I absolutely love this bandana wreath! I’m going to make one for my mom’s room at her nursing home. I cant find 15″ wire wreaths. they are 14″ or 16″ or 18″. That’s totally fine! I’d go with the 14 inch form and it will still work out just fine. I purchased my 22×22 inch bandanas from Amazon. I got a dozen of each color and the prices for a dozen ran $7.73-$9.73-$10.98. So, they were a bit cheaper and I plan to make an 18 inch wreath with more bandanas for a thicker presentation. I’m excited about it, and if it turns out well, I may make some for other holidays. I’m handicapped and can’t get to Dollar Tree or Hobby Lobby, so I ordered my wreath for $6.00. I could have gotten 5 for $30 ($5 each) but I wanted to see if I needed more. Can’t wait for everything to arrive so I can make it!! Amazon to the rescue! I’m so glad you are making it. I hope you love it! Maybe paint or spray hodge podge on the wreath after outs done. Let it dry Ann’s then it can hang pin your door. The Modge podge will protect it from the rain and sun. Orange and black would be cute for Halloween. I went out and bought enough to make 4 of them….. I just got done making one of them. Mine turned out great! Thanks for posting such a cute idea!!! You’re welcome! I’m so glad it worked well for you! I made one of these a couple years ago and love it. Even added stars on the blue “field”. Get great compliments, too. I may have used larger bandanas and the ends past the knot have begun to go limp. Ideas to keep them standing up straight? Spray them with some starch and iron. THat should do the trick! Just made mine and love it! I added lights to it and a emblem in the middle to finish it off. Gorgeous! I actually think a little fraying would be cute on this. I made this today. I used a heart shape wreath form. It turned out super cute. Thanks so much!! A heart shaped wreath form would be ADORABLE! Great idea! If you do use glue on the edges you could put a lil gold or silver glitter to add a lil sparkle, also I put 4th of July picture collage in the middle and gift to g-grandma, she loved it. I use a bigger ring and put the pictures back to back laminated and attach in the middle of the ring, add a string to it and she hangs it on her patio outside. 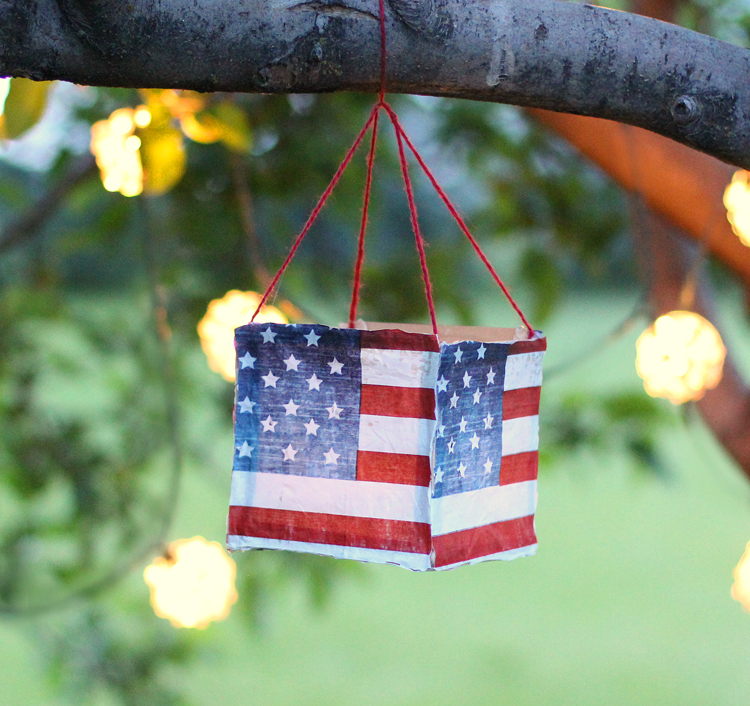 Add glue to the edges with gold glitter, add a collage of 4th of July pictures in the middle, laminated with pictures back to back. Put a string on it and hang so it can twirl around. I approve each comment before they post, so it takes a while before you can see it. Couldn’t you use a dap of hot glue at the knot to hold it together so it won’t come apart? Is there anything beside starch to help stiffen the fabric? I’m considering using fabric and cutting with pinking shears as I’m having trouble finding all the colors I need! It would be easy to use fabric for different holidays! Great idea, thanks for sharing! My 8 yr old granddaughter and I will be making these, and tie dye tennies! Just made one today! My mother-in-laws birthday is coming up July 3, will make a fantastic gift! Already thinking of one for Halloween and Christmas! can buy fabric and cut with pinking shears. Looks good. I was asked to make one of these as a door prize for a Veterans Dinner, I think I will take some wooden stars and paint them white, and hot glue clothes pins to the back to attach them to the blue field. No one has mentioned needing more bandanas than your suggested 5-5-4. I’m in the middle of making mine and am glad that I bought enough to make two wreaths but it looks like I’m going to need all 28 for this one. I don’t know what I’m doing wrong if I am. Tried to count how may you have used and it is more than 14. Did you cut them in half before tying them on, I have made several 14 inch and used exactly what the directions say 5 red, 5 white and 4 blue. I also made a 12 inch and used 4 red, 4 white and 3 blue. I don’t know what happened to my previous message but am glad that it isn’t showing. I would be doubly horrified to have the FB world see, and I thought I was a fairly smart person, how simple mathematics was totally lost on me. Thanks for the great idea. My wreath looks great!!! This was a great craft to do. I already made one for my daughter and myself. When you put the bandana on the form I folded it in 1/3 and tucked the rae edge inside. This should help so it won’t fray. Just finished making one of these and I love it! Thanks for the idea! Also, I used a smaller styrofoam ring and, to keep the bandanas fro coming undone, I stuck a straight pin through the loop in the back and into the styrofoam. Worked like a charm! This is great Jennifer! I have health issues and have always sewed and done crafts but now I’ve been looking for something simple yet amazing! I haven’t made it yet but I think it’s just what I need! Thank you so much! I made my first ones today. I did a 14 inch and a 12 inch. I couldn’t decide which I liked better and just happened to lay the smaller on the larger and turned it a bit so the colors DIDN’T line up. I loved the look so much as it looks 3D .I am going to wire the 2 together and hang it.i have more wreaths to make as gifts but plan on doing more for Halloween, Christmas and Valentines day. They are so easy and so cute. I done mine worth a 20″wreath and it turned out great! Planning on doing more and maybe use the smaller wreath. Haven’t decided on that part yet. It was soo easy to make. I made one for my dad for Father’s Day. He’s in a VA home and it is now hanging by his bed. He loves it and is getting lots of compliments. Thanks for this simple but stunning project! I tried this and it turned out beautifully! I used a 16” wire wreath and 5-5-5 (1 extra blue to make up for the extra space) from Hobby Lobby. I also added a burlap bow and I’ve gorren lots of compliments on it. Thank you for the great idea. Once I got my bandanas cut, the project went very quickly. How do you keep the pieces to stay stiff. Mine, once I hang it up, fall forward. If you’re having trouble with limp fabric, use spray starch and iron them before tying them to the wreath form.